One of the most important considerations when planning new septic tank installation is the right material for your system. Although there are several types of septic tanks for sale, including plastic, fiberglass, and steel, concrete stands out for several reasons. Wilson & Roy Construction in Nancy, KY, offers a variety of high-quality concrete products that can be custom designed to suit each client’s needs, and their contractors explain the advantages of installing a concrete septic tank. In many areas, it’s illegal for property owners to install plastic or fiberglass septic tanks. However, a concrete model is accepted in any region, making it easy to obtain a permit. Concrete is a strong material that’s impervious to rusting and other damage, unlike many septic tanks for sale. It’s also less susceptible to breakage when installed using earth-moving equipment and can withstand significant overhead weight. If you have a large household or need a septic system for a commercial property, concrete is typically the tank material of choice. It can be used to create a larger tank than is practical with other materials. The weight of a concrete septic tank keeps it in the ground solidly. This eliminates concerns the tank might shift or float to the surface — risks property owners face with lighter materials. Unlike other materials, concrete doesn’t include chemical or artificial components that could be toxic to the environment when installed in the ground. A concrete septic tank also lasts for decades with proper care, reducing the demand on resources required to manufacture a new septic tank. When you consider critical septic tank factors, concrete is an obvious material choice. 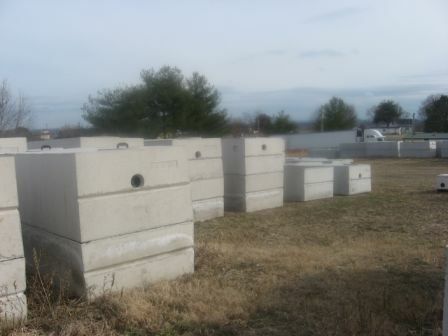 The professionals at Wilson & Roy Construction in Nancy, KY, offer a large inventory of concrete septic tanks and can help you choose the best one for your usage and property. Call (606) 636-6457 to speak with a contractor and visit them online to learn more about their services.